British literary jack-of-all-trades Maurice Baring first rose to prominence as a writer of travelogues, which he later parlayed into a career as an intrepid war correspondent. When he shifted his focus to fiction, his prose retained the local color and rich detail that characterized his earlier nonfiction work. 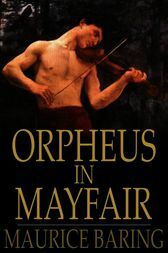 The tales collected in Orpheus in Mayfair and Other Stories and Sketches represent a broad cross-section of Baring's oeuvre.